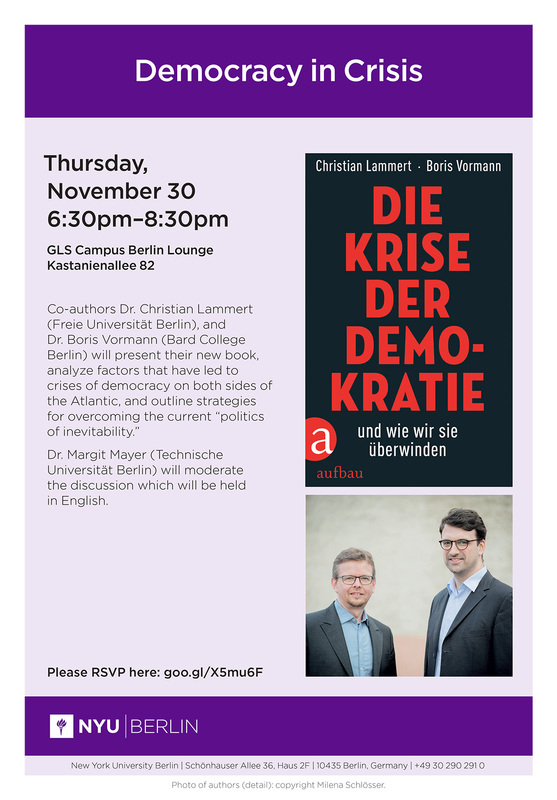 On Thursday, November 30, NYU Berlin is hosting an event, Democracy in Crisis, that will explore pressing contemporary political questions in a global context. The discussion will feature Dr. Christian Lammert (Freie Universitat Berlin) and Dr. Boris Vormann (Bard College Berlin) and be moderated by Dr. Margit Mayer (Technische Universitat Berlin). 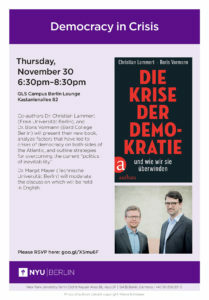 Dr. Lammert and Dr. Vormann recently co-authored a book on democracy in crisis and they will present their work. Questions to be considered include: What is common to the crises of democracy on both sides of the Atlantic? In which ways do they differ? How has economic liberalization hollowed out the political values of liberalism as an ideology and a set of political practices? What are the roots of a “politics of inevitability” that deems marketization to be the only and best way to govern societies?